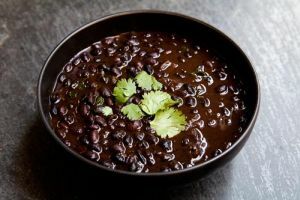 Spicy Black Beans is a Venezuelan food recipe called Caraotas Negra. 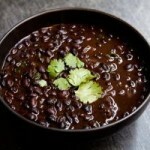 Put the beans in a large pan, add the water and soak overnight. Do not change the water. Add the chopped bell pepper to the water with salt and vegetable stock. Cook beans and pepper on medium heat for 60-80 minutes, until cooked. Meanwhile gently fry the chopped onion, chillies and garlic until golden brown. Stir in the cumin and remove from heat. Add the onions, chillies, garlic and cumin mix to the beans and simmer for a further 8-10 minutes. The finished dish should have a good measure of juice (soup), which is often served separately from the beans.